shuggie - Nice job! Those little horizontal highlight lines on the far part of the floor are a bit distracting though, I don’t think that would be there on most real floors. nihylius - Good job, I like the one on the right. It might benefit from some rim-light on the back-lit things. Maybe you could get rid of the dark edges in the background esp. around the window and in the left corner. Maybe some surfaces might use a little specular light or reflections too. cgb777 - Good start, nice ceiling texture. One thing that jumps out at me is that the lightbulb doesn’t seem to be lighting things much, not even its own shade. If you really want it to look dim, maybe you can make the bulb itself look yellow instead of pure white and leave a few reflections on it? fulg0re - That’s a nice image. I’m sure you noticed that one of the wooden beams came up a little short there. The textures don’t look blurred, maybe the trees in the background just look squashed a bit. Maybe in your next version a little more light could be coming through the rear window, at least lighting the sides of the window itself? Heres my WIP, about 15 spotlights, GI at very low setting and negative light used, along with shadow lights. Textures are still WIP. What can I do to improve this render? Maybe it’s been said already, but there not a single file that 3ds can read that is not wacked. arches are not right (bad geometry). can the author of the scene fix it ? There are some very amazing talented lighting works in thie challenge. Tho I am not a lighter, but I wish to throw some words here as a viewer point of view maybe will help a little for your challenge. 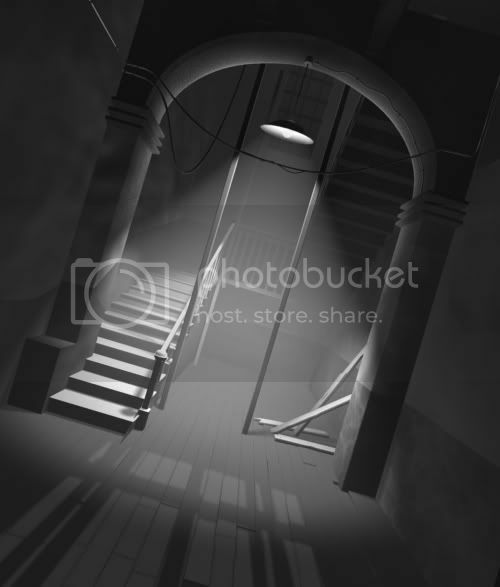 Altho it is a lighting challenge but those submittion that really caught me feel the horror of this haunted house are those with the minimal lights. Especially i feel that the right stair case should stay 100% dark (no light). 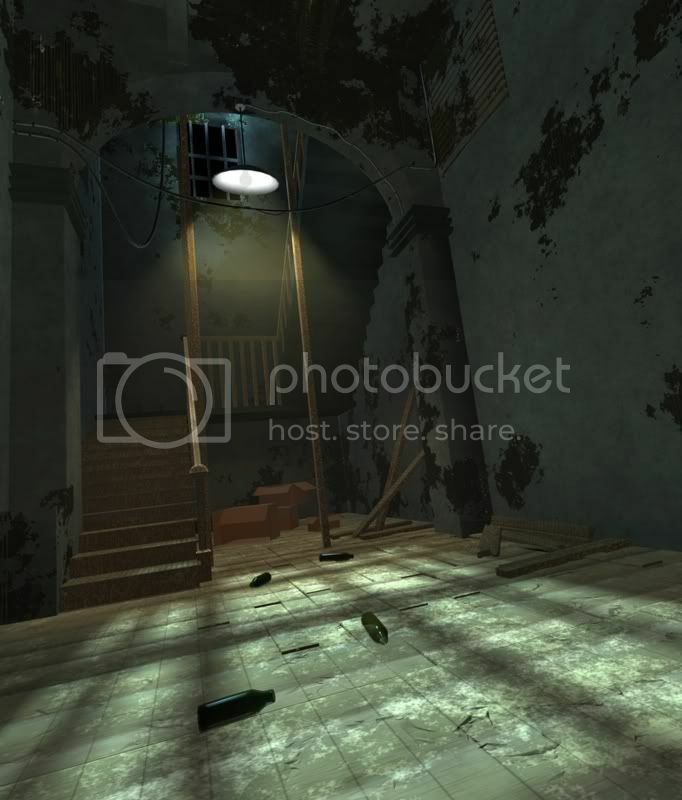 I am assuming that im walking thru the hall way walking up the stairs(either in realife or playing video games). If there are lights are shown in my destination, i won’t feel the scaryness. In fact, if my destination is so dark and i don’t know if there are any moster crowing on the ground, or any zombie up on ahead those are really made my heart pounding. Which means in otherword (i think) dark creates horror. Thanks to Jeremy and Matt for your suggestions for improvement. Here is my second try. Been lurking in this thread for the last few days, tinkering on my own take on this - been utterly dead at work. Might post something today. I disagree. A light at your destination can create feelings of tension (if its a spooky light) or a feeling of relief (light at the end of the tunnel). Depends on the story one is trying to evoke - what if the viewer is running from the darkness behind them toward the light, only to find that upstairs is even worse? Ok, here’s my attempt. The first pic is a straight render, the second a version I tweaked in photoshop (though for some reason rendering it in passes destroys my volumetric light - problem for another day). Seven lights in total, no GI. 12minute render. The feeling I was trying to achieve was a ‘light at the end of the tunnel’ thing. Dark downstairs, but with approaching dawn, and a possible respite from whatever lurks in the basement Obviously in the second pic, the light at the end is less appealing, but better than the dark. Edit: Oh yeah, lots more texturing work to do. Great contributions so far, all very different and moody. Well, it doesn’t look very haunted but I’m planning on working on a night version. I liked this one enough to post it. dragonP - I’m a little confused by all the criss-crossing diagonal lines, it looks like diagonal to the right comes from the hole in the wall, grid on the floor comes from somewhere else maybe, diagonal towards the lower left corner I can’t tell where it’s going. Also, there are strange blotches around many of the walls that sometimes look like cookies projected from spotlights. Maybe all of this can be simplified or you don’t need it all? 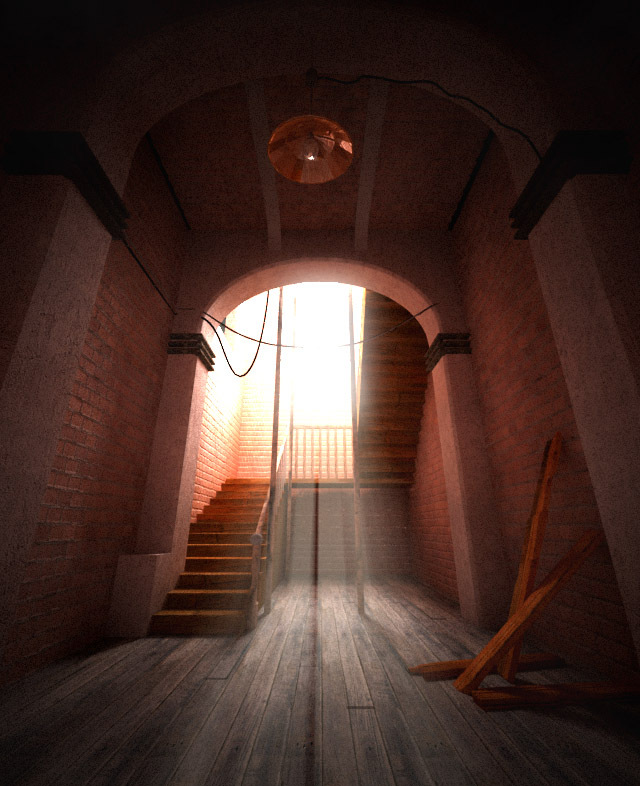 Iwam - You probably noticed this by now, but I think in all versions (including Dan’s original Maya file), there’s an extra copy of an archway that you can delete. 60WE - Welcome! That’s a nice image. My first response was that it looked a little over-filled (could use more contrast), although the mistiness is a nice look… maybe some darker foreground objects could add interest? Tryn - Looks good! Maybe keep going with the right (red) one? The foreground could use some texture and maybe it could get darker with just some specular kicks spilling into it or something? B.R.Rajeev - Good start! Maybe some of your lights are missing shadows, especially for boxes and bottles? Also, light on the lower floor looks as if it comes through a window, but when I look up at the window it doesn’t look like light is coming through it. viclio - Nice image! Maybe the light could be turned just a little less symmetrically, and that would fix the center stripe running though the middle of the fog? Maybe some of the red walls and boards are a bit too diffusely lit and might take some more darkening towards the edges and in shadow areas? Thanks for your comments, Jeremy. I have a question for you regarding light colour: If you have direct sunlight(yellow/red) and indirect lighting from the sky itself(blue) coming from the opposite direction, would the two colours illuminate the same space? 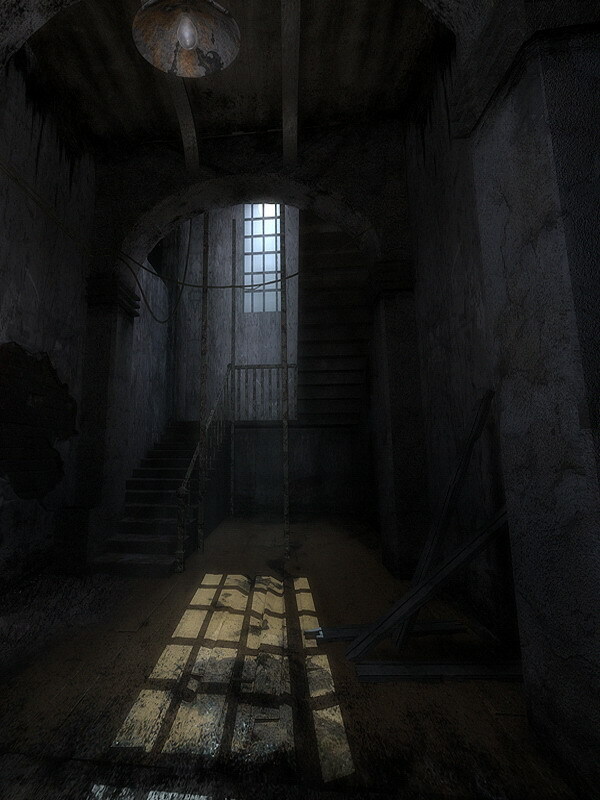 In the first version of my scene, I have strong yellow light representing the sun coming from the right hand window, and blue for the sky from the left hand and centre windows. I’m getting the feeling after looking at it for a while that this is incorrect. I hadn’t realized that was what you were trying for, it just looked like the light was coming from upstairs. For the sun, direct sunlight comes from very far away, so all the rays appear parallel. A point light or spot light positioned only a few meters away from the window will not cast a believable sunbeam, you’d need to more the light much farther away or just use an infinite or directional light type. For the sky, the sky light comes from all directions: right next to the sun, just below the sun, just above the horizon, straight down, left, right, etc. Often you need several area lights outside a window, big enough to cast soft shadows, to cover all the angles from which skylight enters a window. Look around outside and skylight is everywhere, mixing with direct sun wherever there is sun. Firstly i would love to say thanks to u as u have done great job in this Lighting Chanllenge I really like the way u put art effect in ur render. Once again thanks for the max file for this task, but the file has so many problems in it’s mesh. so i have to make everything correct. if there is no sorce of correct max-9 file…! anyways its not a big deal,i can work it out on my oun. I am not too good in lighting as i have just started Vray lighting. but i am sure as of us try this out with the best efforts. U can see my previous post that i have posted may be 1 year before. heee heee… don’t worry i am not a lazy person but too much busy with my job and all…! so here is my work…if would be so nice if u give me C&C…! I will soon Post my render for ur lighting challenge. Yeah, thats more or less the setup I have - an area light at each window, plus a light for the sun itself - C4d has parallel spotlights which work like directionals, but allow you to add lightfog, etc. I might try a different solution for the indirect light, because one area per window doesn’t seem to be enough. My question was more about how the colours interact. I was going off the colour temperature guide in your book assuming I had “film” balanced for indoor use, and the red/yellow and blue lights looked odd hitting the same surfaces. I’ve just desaturated the blues, and it looks better, but as I said above, I think I’m gonna rework them entirely - sorry I wasn’t clear with my question. Jeremybirn - Thanks for the feeback. Indeed, the dark stripe in the center of the image has nothing to do here. I rendered the volume light on another pass and didn’t notice it didn’t belong here. I’m going to add some dirt to the wall, to darken the edges. About the symmetricallity I like it this way. I’m working on another version with a different point of view. Jeremy first I want to thank you for your words and for your tips! Here is my Haunted Hallway V2, as you suggested I added a couple of object and I changed the color temperature of the image giving a bit more contrast and trying to keep a bit of mistiness look. how are you people importing these files into 3dsmax? I’ve got viz here at work so I expect the max file not to open and have yet to try it at home. But is there a way to import obj or fbx files into max? edit ok Fbx imported but has alot of screwy faces…any tips on importing the obj format? or can someone save out a 3ds.